Our Junior karts are specially designed with full bumper protection, seat belts, seat pads, roll over bar, adjustable seat, adjustable pedals, so we can fit drivers of different sizes. 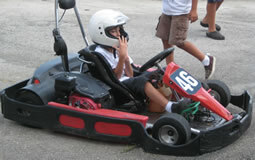 We supply helmets and give safety instructions prior to entering go-kart. All participants are required to have an adult sign a liability waiver before racing. All participants should be in good health with no neck, back, heart problems. Go-karting is a physically demanding sport.